South Carolina is slated to lose out on $807,000,000 dollars in Federal Funding over the next eight years for not expanding Medicaid. 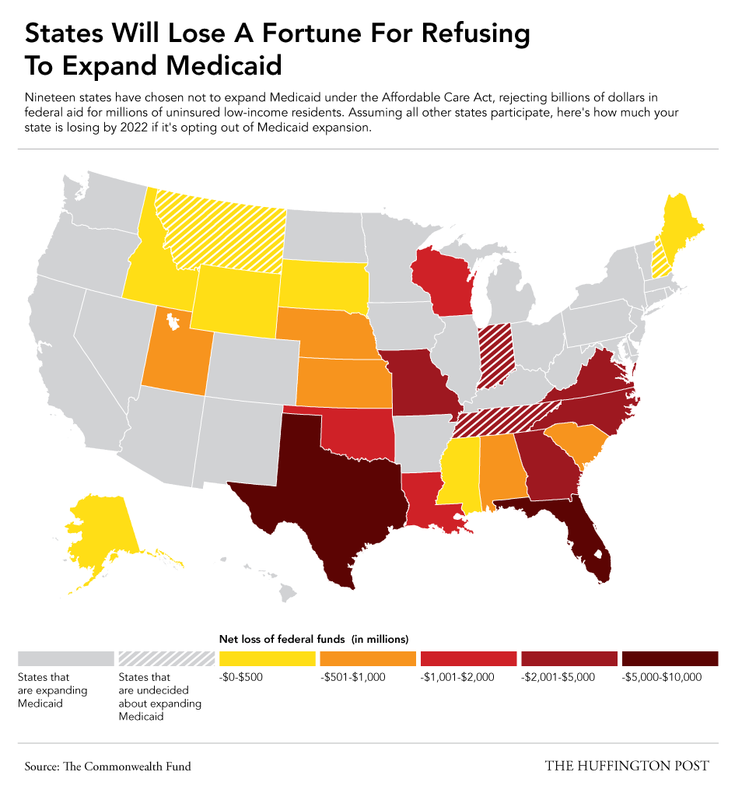 Following a 2012 Supreme Court ruling that made Medicaid expansion under the Affordable Care Act optional for states, 20 states have opted out of the reform, rejecting billions of dollars of federal funding for low-income residents [...] If adopted by all states, the Medicaid expansion -- designed for residents at or below 138 percent of the federal poverty level -- is projected to provide 21.3 million Americans with affordable health care by 2022 while reducing states' uncompensated health care expenses. The study comes from the Commonwealth Fund, an organization that was founded in 1918 and whose goal is to, "promote a high-performing health care system that achieves better access, improved quality, and greater efficiency, particularly for society's most vulnerable, including low-income people, the uninsured, minority Americans, young children, and elderly adults." "The ACA’s expansion program covers 100 percent of Medicaid costs for new enrollees through 2016, gradually reducing assistance to 90 percent cost coverage by 2020. Many of the states refusing to expand Medicaid under the ACA cite potentially harmful fiscal impacts on their state budgets, although expanding Medicaid coverage costs less than 1 percent of state budgets on average, according to a December report by the Commonwealth Fund." Check out the full write-up at the source.